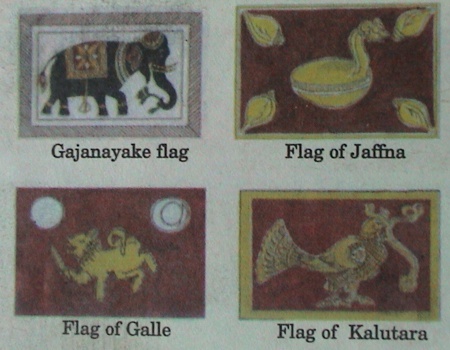 In theory, all of the provinces of Sri Lanka (there are currently 9) have their own flag, and most (but not all) are based upon (supposedly) ancient Singhalese flags (or at least symbols) for each region. In my professional capacity, however, I have travelled the length and breadth of Sri Lanka (including those regions under the control of the insurgency group, the LTTE), and can say without equivocation that I have never seen a provincial flag (or provincial emblem of any sort) on display. Moreover, as part of the same trips, I have visited all the provincial capital cities, as well as held meetings in the chief secretariat buildings of each provincial administration - i.e. places where one would expect such provincial flags to be flown - and none were on display. As a result, it is impossible for me to avoid the conclusion that although provincial flags might exist in theory, in practice, they might as well not exist, since they are never displayed. About 15 years ago, when the issue was first broached, the government went ahead with a public contest, dominated by entries from village committees and artists; and it was from these entrants that a committee of bureaucrats selected the various designs. 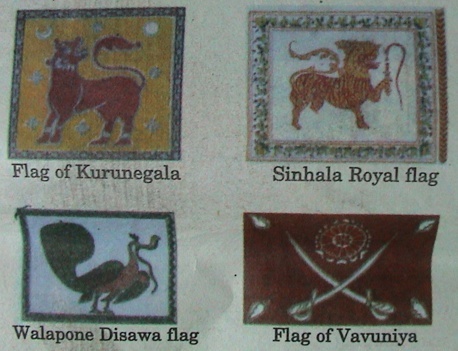 These flags of Sri Lanka seem to be ancient provincial flags. They were recently published on a children's newspaper supplement to the Sunday Observer. More information can be found on the article at http://www.sundayobserver.lk/2005/10/23/juniorob03.html.